Old Florence is fast disappearing. The characteristic narrow streets, where the midday sun only shines down through an irregular sky-line of picturesque eaves and gargoyles nearly meeting overhead, are, one by one, being widened into grand, new streets which take a gay Parisian aspect. Grim old palaces put on new faces, and only their general solidity and name preserves the aroma of antiquity. Now a square, ironbeamed market-place has arisen, which is to substitute that quaint, bewildering, parti-coloured, semi-mediaeval conglomeration of human life and curiosities which has for century on century been the mercantile heart of Florence. The old market, and its twin sister the Ghetto, are both doomed to destruction they are, in fact, to be offered as a sacrifice to the modern deity, Hygiene. It is right and just that this should be so, but before they disappear from our midst some slight picture of the old Florence, which will never be seen again, should be preserved. 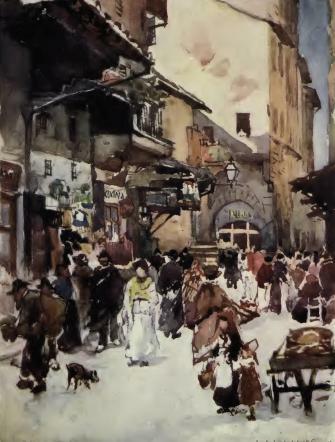 The Ghetto and Mercato Vecchio stand side by side, a mass of lurid tenements, with black walls and small windows, piled story upon story in narrow streets almost cavernous in their darkness, and propped house against house by flying buttresses high in air and gloomy archways nearer earth. Among these dismal abodes are larger and more imposing houses, with remains of ancient towers, and sculptured arms and ensigns of extinct guilds on their time-worn facades: these are the old palaces where the potentates of the Middle Ages and the rich burghers of the commonwealth lived in state, for this district which is now given over to squalid poverty was once the very city of Florence. There is this difference between the last fate of what we have called twin sisters. The Ghetto keeps all her abject mysteries shrouded from the light of day, for no one dares to penetrate her gloomy cellars and the cavernous alleys which hide in these days, not the despised Jews, but all the wretched, hopeless population whose doings, morally and actually, shun the light of day; while the old market close by is still the chief artery of modern life, and is crowded from morn till eve with a never ceasing stream of buyers and sellers. In the Ghetto are squalid old men and women who have never seen the sunlight, and who look on rain as a strange phenomenon, for they have passed a life in the dark cellars, from whence they dare not emerge. All the countless families draw their water from one well in the midst of a dark piazza., and this piazza, seems to have represented the outer world to most of them. It has long ceased to be the prison of the Jews, who were confined within its gates in 1571 by Cosimo I for in these days the Jews are a great power in the city. But misery, crime, and want lurk there instead. The old market keeps better company. The archbishop’s palace is in its precincts, a church stands at each corner, and in its narrow streets are the decaying palaces of the Tornaquinci, Vecchietti, Amieri, Neri, Medici, and half the names glorious in Florentine story. A dim memory lingers of a marvellous palace built by the Tosinghi, about A.D. 1100, the tower of which was covered with rows of little Lombard galleries with white marble colonnettes like the tower of Pisa this has passed away, but less ancient beauties remain. There is the Vecchietti palace, where John of Bologna’s black demon grins in endless hideousness, at the corner where the Devil himself galloped by, on a black horse when exorcised by St. Peter Martyr. It was in this house that John of Bologna was sheltered when he came as a foreign artist to study in Florence, and its owner was his most liberal patron. But the Vecchietti palace has older memories than these. 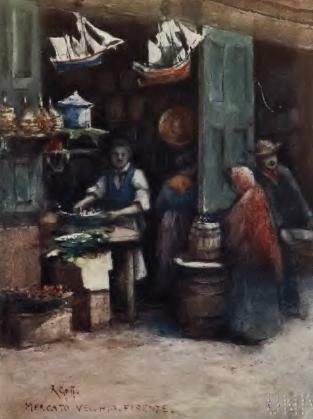 There lived the Cavolaia, or cabbage seller, who in mediaeval times had made a fortune by selling the produce of her podere in the old market, and at her. death ordered the bells of the cathedral and All Saints’ Church to be rung for her soul from All Saints’ Day to the end of Carnival. Her bones are said to be in the tomb of Bishop Ranieri in the Baptistery, though history does not explain how they got there. The Amieri palaces form quite a district of the Mercato; their half-demolished towers date from Ghibelline times, and the last Amieri, Bernardo di Nicolo, is known to fame as the father of Genevra, whose story is one of the quaintest legends of Florence. Refused the lover of her choice, and betrothed by force to Francesco Agolanti, she afterwards fell a victim to the plague in 1400. Believed to be dead, she was placed in the family vault in the cemetery by the cathedral. She awoke from her swoon on a bright moonlight night, and, bursting her bandages, escaped from her ghastly prison, and, clad in her shroud, went to her husband’s house. He exorcised her as a spirit, and refused to open his door. Her father did the same, and no one would afford shelter to her resuscitated person but the family of her first lover. The marriage with Agolanti was decreed by the tribunals to be annulled by her death and burial, and she was by this curious quip released to begin a happier life with Rondinelli, her first love. To this day the street she trod on that moonlit night is called Via della Morte. Another interesting house in the old market is that of the Castiglioni, which has some fine old sculptured doorways and chimney-pieces. Dante Castiglione was a famous person at the time of the siege of Florence, 1529, not so much for his prowess in war as for a duel he and Martelli fought, against Bandini and his second in rivalry for the smiles of a belle named Marietta de’ Ricci. As the combatants belonged to the two opposite parties who were striving for supremacy in Florence, the duel (or double duel there being four combatants) assumed a political importance, and was taken by the superstitious Florentines as an omen of the fate of the war. Florence 1887. Since this was written, the reluctant Florentines have been driven by force of municipal law to use the iron-bound modern market-place in San Lorenzo; and the six hundred families crowded into that human hive of misery called the Ghetto have been turned out into more healthy abodes, in disused convents or model houses for the poor, where it is hoped that new influences and fresh air will bring new moral and physical health to them. The empty Ghetto has been the exploring ground of artists and physiologists; it has been the scene of carnival gaiety, when the artists with their magic brushes transformed it into the ‘City of Bagdad’, and illuminated its darkest mysteries and gloomiest caverns with electric light. This year it is to undergo another transformation under these artists’ hands, and to represent ‘Cinque-Cento Florence’, with Donatello at work in his studio; after which both Ghetto and Mercato are to fall under the reforming touch of improvement. Florence will lose its most characteristic remnants of mediaevalism, and gain in a sanitary and moral aspect. Augustus Hare (‘the thinking man’s Baedeker’) in the sixth edition of his guide to Florence (1904) included the following list of best hotels in Florence. Hotel Paoli, at the end of the Lung’ Arno della Zecca, near S. Croce, quiet and suited for winter quarters. Hotel Bristol, comfortable, more central. Hotel Anglo-American, Via Garibaldi, reasonable. Hotel de la Ville, large, central (Piazza Manin). Hotel New York (once Palazzo Ricasoli), newly done up (Piazza del Ponte alla Carraia). Hotel Savoy, in the centre (on the site of the Mercato Vecchio), comfortable, large, expensive. Hotel Minerva, near Santa Maria Novella, quiet, clean, and old-fashioned, no view. Hotel Grande-Bretagne and Royal adjoining, frequently under new management. Hotel Albion, small, facing the Arno. Hotel Berchielli, small. Lung’ Arno Acciaiuoli. Hotel Europa, 3 Via Tornabuoni. 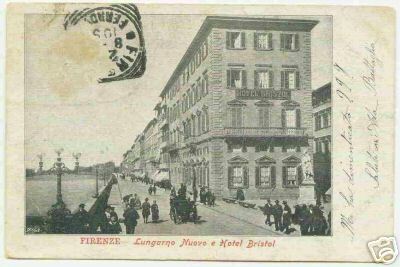 Hotel Washington, near Piazza S. Trinita, and facing the river (Lung’ Arno, Amerigo Vespucci).